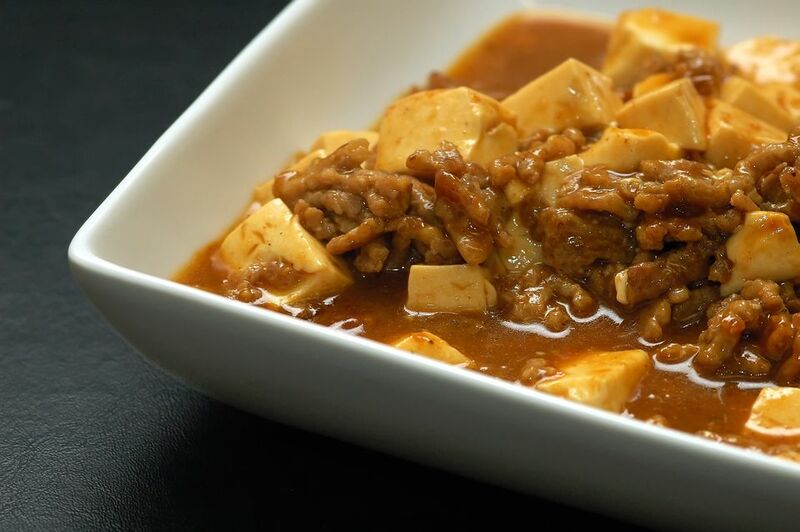 If you’re looking for a quick and easy version of Mapo Tofu, a classic Szechuan dish, try using store-bought black bean sauce, which takes the work out of chopping fermented black beans. Drain the tofu and cut into cubes. Marinate the ground pork in the soy sauce and cornstarch for 20 minutes. Wash the green onions and cut on the diagonal into 1-inch pieces. Peel and finely chop the garlic. Heat the wok over medium-high to high heat. Add 2 tablespoons oil. When the oil is hot, add the chile paste and the chopped garlic. Stir-fry until aromatic (about 30 seconds). Add the ground pork. Stir-fry until the pork is nearly cooked through. Lower the heat to medium, and add the black bean sauce and the tofu cubes. Cook over medium heat until the tofu is browned (8 to 10 minutes). Add water or chicken broth as needed. Stir in the green onion. Just before serving, sprinkle with the Szechuan peppercorn or ground coriander.